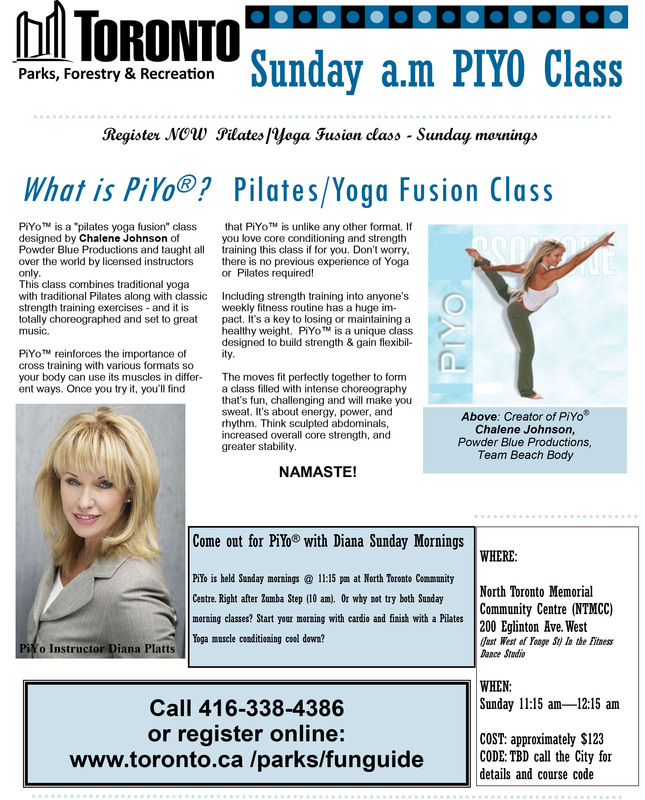 PiYo™ is a “pilates yoga fusion” class designed by Chalene Johnson of Powder Blue Productions and taught all over the world only by licensed instructors like Diana. This class combines traditional yoga with traditional Pilates along with classic strength training exercises – and it is totally choreographed and set to great music. PiYo™ reinforces the importance of cross training with various formats so your body can use its muscles in different ways. Once you try it, you’ll find that PiYo™ is unlike any other format. If you love core conditioning and strength training this class if for you. Don’t worry, there is no previous experience of Yoga or Pilates required! Including strength training into anyone’s weekly fitness routine has a huge impact. It’s a key to losing or maintaining a healthy weight. PiYo™ is a unique class designed to build strength & gain flexibility. The moves fit perfectly together to form a class filled with intense choreography that’s fun, challenging and will make you sweat. It’s about energy, power, and rhythm. Think sculpted abdominals, increased overall core strength, and greater stability. 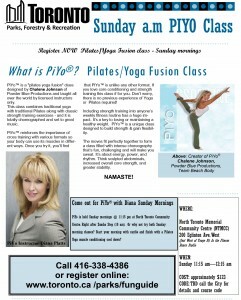 Diana teaches this class Sunday morning at 11:15 a.m at the North Toronto Memorial Community Centre (see Class Schedule page for details on how to sign up through the City of Toronto or visit the Fun Guide, Active Living phone or website).